I sat there at the kitchen table, hunched over my keyboard, finishing an article I was working on. The house was quiet, except for the sound of the ceiling fan, some soft music, and water trickling in the fountain on my counter. I stopped and looked around, but didn’t see anything. Thinking the sound must’ve been part of the music, I shrugged and went back to writing. I paused and listened harder. Was the fridge making noise? Was it my kids’ mice? I got up and checked their cage, but the mice were sound asleep. I sat back down to type. I have to admit, at that point, I got a little creeped-out. Slowly, I got up and checked to make sure the front door was locked. Then I went back into the kitchen and began walking around, determined to get to the bottom of things. And that’s when I saw it…. 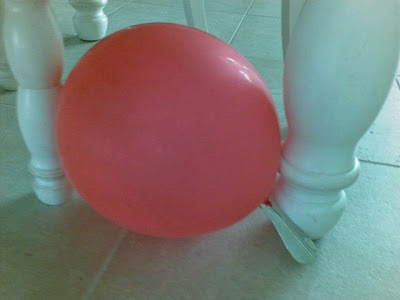 red balloon with a shoehorn tied to the bottom of it. All I know is that it was another one of my son’s inventions, and the ceiling fan was blowing the balloon around on the tile, dragging the shoehorn with it. I’m sure my son had a good reason for tying the shoehorn to the balloon. Just like I’m sure he had a good reason for the tornado in the salad spinner. And the soap on the shower wall. And all the other creative things he comes up with. And I should be thankful that he does. I would have been creeped out too! Checking all the doors and the closets.I love the imagination of kids! They just amaze me! Thats too funny. I would have been totally creeping also. Ah, little boys and their minds a spinning…always wondering whtat they can make next. I just read your post with the spider. Very funny! I’ve wanted to get a little rubber snake and play a little joke on my kids. That’s not mean is it? Such a boy thing!!! It is crazy the things mine will do too!!! HA!!! Life sure is fun when there are children in the house. You should see some of the creative ideas my youngest son still comes up with. Maybe someday I’ll have to post a few of them.Have a great day. Oh – so funny. How fun must your son be! That is funny. I give him points for his creativity. *Smiles* Don’t kids add so much to life?? Even if it is the creeps…Great story! Oh, gosh–I’ll bet you were relieved! We have mice of the uncaged variety, which have invaded our house. We’ve see 3 in the past 10 days. Talk about All. Creeped. Out! I have given you something on my blog!! Haha! He really is quite a clever fellow :) I love the things he comes up with! That is so funny! I love funny inventions. Most shoehorns have a little hole in them, so I have always thought they made good weights for balloons :) !! Shoe stores have also picked up on this idea. So cute! That is funny! I have a fear of helium balloons because one night I was getting ready for bed and all the lights were out and I saw what looked like a head a little shorter than me and I thought itwas my son so I start talking to him and there was not any response so I started to panic and reach for the light with trembling hands just to see one of the kids helium balloons floating in mid-air. It has freaked me out enough I don’t allow the balloons at my house after dark. Crazy huh! That is funny, my son does funny stuff like that. Last week I found a matchbox car in the fridge. I can’t even click on the tarantula post…sorry.But the big bad balloon…how funny. I’m grateful for curious little boys too!good luck on your new gig?! may it be a paid one! That is too funny… I would have been sneaking around the house all nervous unti I foubd the culprit.I know my son is always doing crazy things and I often ask, why? What a fun littl eproject I’m sure it was for him! I would have had to scour the place for the noise myself! We had a click thing like that going on too – it turned out to be a sign hanging on our porch banging with the wind…. but, it really bugs you until you can figure it out. Such imagination! Too funny. Sounds like an inventor–your son.Sweet post! Isn’t it funny what children will invent? I love it! I would have been a little creeped out too. That is so funny! Kids come up with the best stuff. My son loves to invent stuff, too.And I would have stopped what I was doing, too until I found out the source of the noise. ROFL! The last noise like that I heard turned out to be my laptop ticking. Yours is much more fun. It’s nice to have someone to blame for all the random wierd things that happen around the house, rather than wonder who the intruder is . . . Sounds like a great kid! Kids are so goofy… I can relate to these experiments and I enjoyed reading the past posts! !Your son has such a fun loving spirit- a great quality!! Cute post! I’m sure I would have been a little creeped out myself. What a creative little guy you have. I was very glad to hear that it was only a balloon. With that constant distraction, it could have been an unwelcome creature in your house! My son is very creative also. His mind never stops working. We don’t watch much tv at all. We really don’t need to. This made me laugh! Kids inventions are great aren’t they? I often wonder when the kids have moved out and I am in my house alone if I will still hear noises and think they are from my children. I am sure we will miss finding the strange creations of our children. Thanks for asking about my friend. She is on her third round of chemo and so far so good. She is a fighter. She is in a clinical trial so hopefully that will help her battle. Thanks for asking! boys bring such adventure to our lives. Thanks for sharing your humorous experiences! BTW, I’m hosting a Recipe Week on my blog, starting tomorrow. Please stop by and see what’s cookin’! I was getting a creepy feeling just hearing your story. I hate being in an empty house. But I’m pretty sure the balloon was harmless…although I am confused about why it would need shoes..and thus a shoe horn? That is too cute. I find my boy also likes to tie things together. He rigged up a string to his wall light switch so he could “turn off the light without getting out of bed”. Gotta love those little future inventors.